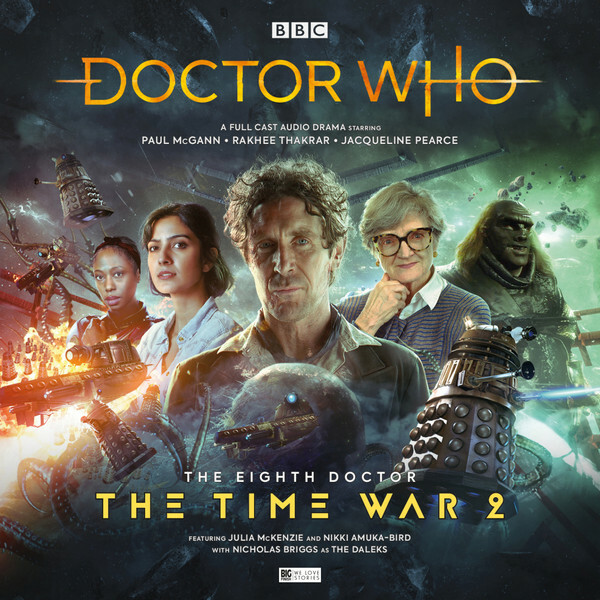 Paul McGann leads an all-star cast in this 5CD set, including Rakhee Thakrar (Time War companion Bliss), Blakes 7’s Jacqueline Pearce (Cardinal Ollistra), Marple’s Julia McKenzie (the Twelve), Luther’s Nikki Amuka-Bird (Tamasan) and legendary impressionist Jon Culshaw (Doctor Ogron) with Nicholas Briggs as the Daleks. The Doctor finds himself drawn closer to the heart of the conflict in this quartet of adventures set during the early stages of the Time War, visiting a twisted world that was once home to his companion, meeting an old enemy with a new face and waking in a prison designed for the most evil beings in the universe before finally being forced into battle... This set sees writers Jonathan Morris (We Are The Daleks), Guy Adams (The War Doctor: Pretty Lies) and Timothy X Atack (The Wreck of the World) throw some out-there elements to the Time War, introducing the Twelve – the new ‘little old lady’ incarnation of the villain previously known as the Eleven – as well as an intriguing new take on the Dalek’s old henchmen, the Ogrons. The Time War is about to get stranger.